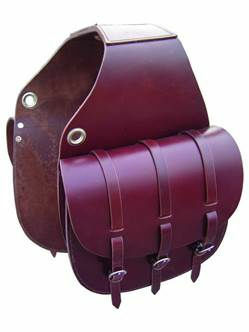 These saddlebags are extremely functional, made of smooth, high quality leather. Three buckle enclosures keep your items safe inside two roomy, gusseted pockets. Two sturdy grommets ensure your saddlebags will tie securely to your saddle. Triple laced straps with nickel hardware. Measures 11�x11�.